Co-working is an evolution and it will eventually change office space properties. In words of Mr Gupta, "Cooperation, collaboration and community are what make a space a 'co-working space'. There are basically 2 sides of a great co working eco-system - The real estate and the community or the people." Co-working spaces and finances: Office spaces have absconded evolution since a long time. The cost of setting up a traditional office can sum up to a colossal amount. Renting or getting it on lease, getting all the legal aspects done, and setting up the infrastructure only add up to the trouble. "The companies which are financially capable can obviously afford to find, design, customize, furnish and make the arrangements but this is not possible with companies those are financially not that sound. Co-working spaces are trying to solve these problems in the real estate aspects. Even if a property is at a high-end location, the affordability becomes a deciding factor and thus these spaces remains unoccupied. 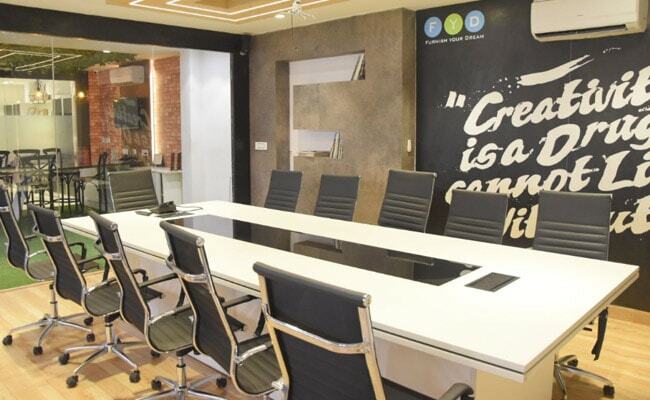 Co-working spaces are subscription based, so you don't need to dump huge sum of money", said Mr Gupta. Co-working spaces and traditional office spaces: Co-working is an evolution and it will eventually change office space properties. The traditional office space properties have to face the truth that shared economy is here to stay and change the way things used to happen. They need to get flexible and change the pure real-estate way of interaction and way they used to function. Co-working office spaces and the ongoing surge: Productivity at work is greatly swayed by the infrastructure and interiors. Everybody loves to come to workspaces those are inspiring and beautiful. If we see in the present scenario, there has been a major shift in the work culture. According to Mr Gupta, the concept of start-ups, solopreneurs and freelancers is growing briskly but this is a secluded journey and a 'co-working space' is where the magic can happen. "Start-ups best work when they are frugal. Instead of concentrating on getting a high speed internet connection or repairing the coffee machine, the time money and energy can be used in far more productive work. So how would frugal start-ups encourage a great working environment for the team? Attracting great minds to work with through ideas and values are not enough. Co-working spaces provides accessibility and a great working environment where solving problems is the only concern", Mr Gupta added. Co-working office spaces and property sector: "The Indian start-ups ecosystem has been a deciding factor in the rise of co-working. Apart from start-ups, freelancers and solopreneurs, even large companies are adapting this culture as it helps them in expansions rapidly. The demand for flexible office space with great infrastructure was never that high. Co-working spaces make flexibility and location accessible at the most affordable plans. The trend is now moving towards Tier 2 and Tier 3 cities too. This will surely be a growth driver for the property sector", explained Mr Gupta.